One of four drive bays in the Mac Pro. The 2009 Mac Pro (model identifier MacPro4,1) was introduced in March of 2009 and was discontinued with the arrival of the 2010 Mac Pro in August of that same year. The 2009, 2010, and 2012 versions of the Mac Pro are still sought after in the used Mac market as they represent the last truly user-expandable Macs. They offered easy access to the interior, where users could add RAM, access four built-in drive bays, and easily add or change PCIe expansion cards, including graphics cards. 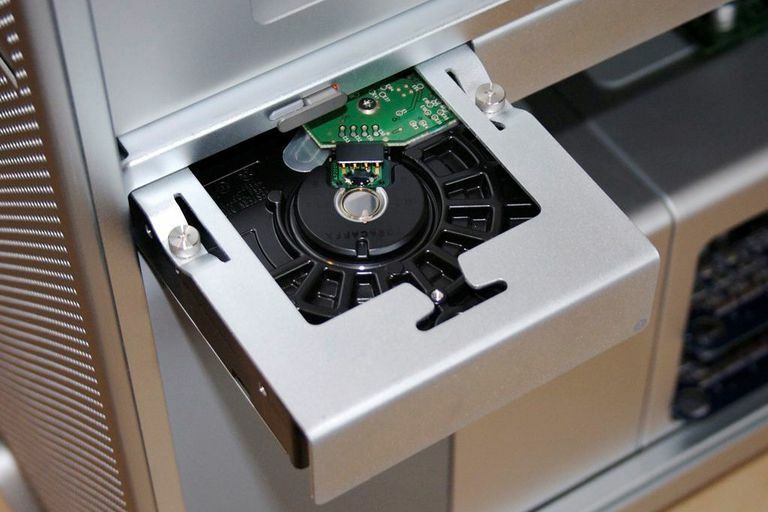 They also offered access to the optical drive bay, which many used as a fifth storage bay. The processors were mounted on easily removable trays and could be upgraded by the end user. With the above as a bit of a background, let's take a look at the original buying guide for the 2009 Mac Pro. The Mac Pro is a tower of 8-core power. It's also eminently and easily expandable. Its elegant design makes adding memory, hard drives, and add-in cards a simpler task than almost any other computer can claim. With 8-core Intel Xeon 5500 series processors, a very fast 1066 MHz frontside bus, RAM that's expandable up to 32 GB, and four easy-access hard drive bays, the Mac Pro is ideal for professionals and avid computer hobbyists. Power and expandability come at a price, of course. Is the Mac Pro right for you, or would an iMac or other Mac computer be a better choice? Let's find out. Do You Need 8 Cores? The Mac Pro is available in multiple configurations, including one that has just a single quad-core processor. The other configurations use dual quad-core processors, for a total of 8 processor cores. That's a lot of processors, so a good question to ask yourself is, "Do I (or will I in the foreseeable future) have applications that can actually make use of these processor cores?" For graphics and video professionals, the answer is a resounding yes. For example, Adobe's After Effects CS3 supports multiprocessing and can render multiple frames simultaneously using each processor core. The ability to expand RAM up to 32 GB is pretty impressive. An application like Photoshop Elements, when combined with 64-bit hardware (like the Mac Pro) and a 64-bit OS (like Snow Leopard), can use up to 8 GB RAM. That still leaves plenty of RAM space available for your system software and any other applications you may need or want to run concurrently with Photoshop. Of course, having an option doesn't mean you have to use it, at least not right away or all at once. The Mac Pro comes standard with 2 GB RAM; you can add more at any time, whether you buy it from Apple or a third party (usually the less expensive option). If I had to pick just one feature that separates the Mac Pro from other Macs, it would be its support for up to four internal SATA II drives. Each drive functions independently in the Mac Pro, and each has its own dedicated SATA channel. An individual who needs fast data access could configure a two-, three-, or four-drive RAID 0 array, while someone who needs guaranteed access to data, even if a hard drive fails, could configure a RAID 1 array. Those who just need (or want) tons of storage space could pop in four 1 TB drives, for a mind-boggling total of 4 TB of available internal storage. With the Mac Pro's PCI Express expansion slots, you could add four graphics cards, each with the ability to drive two displays, for a total of up to eight displays on your desk. I've never seen such a setup, but it could be done. A more realistic option is to take one of the two graphics cards Apple offers, plug it into the double-wide, 16-lane PCI Express 2.0 graphics slot, and enjoy outstanding graphics performance. The currently available choices are the NVIDIA GeForce GT 120, or an ATI Radeon HD 4870. These graphics cards are Mac-specific; third-party cards are unlikely to work. What you can’t get inside your Mac Pro, you can easily add externally. It has two FireWire 800 ports, two FireWire 400 ports, and five USB 2.0 ports; so far, that's not a terribly unusual combination. But it also has two Gigabit Ethernet ports, a front-panel headphone jack, optical audio inputs and outputs, and analog line level inputs and outputs. Given the sheer number and variety of ports, it's unlikely that most individuals will ever need to use one of the PCI expansion slots to add some form of external port. But, that's always available as an option. Is a Mac Pro Right for You? It's difficult to resist so much processing power, not to mention the potential to add gobs of memory and tons of internal storage. But is a Mac Pro the best choice for your needs (and budget)? I think the Mac Pro is a logical choice for anyone who makes a living in graphics, video, audio, CAD, architecture, modeling, science, or software development. It also has undeniable appeal to Mac enthusiasts who like to tinker with Mac hardware, and to diehards who want the biggest, fastest Mac available. But if you don't fall into one of those categories, an iMac, MacBook, or Mac Mini might make more sense.